The Totem Pole, located in Lakeshore Park within Wascana Centre, was a gift to Saskatchewan from the British Columbia government in 1971. It commemorates the centenary of the union, July 20, 1871, of the province of British Columbia with the Dominion Canada. 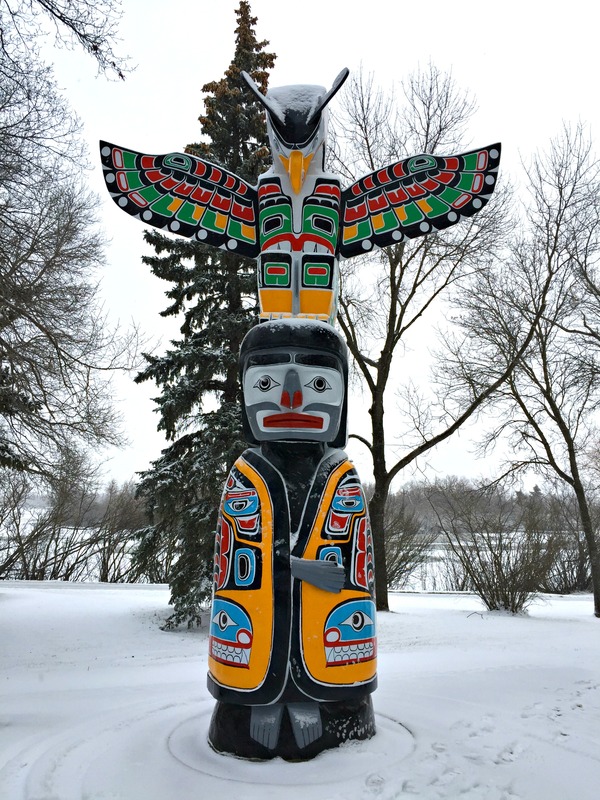 The Saskatchewan totem pole is one of 12 presented to Canadian Centres. British Columbia's gift of a Totem Pole to Saskatchewan was hewn from Western Red Cedar by Mr. Lloyd Wadhams of the Nimpkish Indian Band. It is 16 feet high, three and a half feet in diameter, and weighs approximately 3,500 pounds. In 2016 the Totem Pole was removed and restored after years of aging and damage. Master Carver Lloyd Wadhams Jr., son of the original carver performed the extensive work. Along with restoring the entire Totem Pole, new wings and antennae were also built and installed. The Totem Pole is of the Kwakiutl Nation design. The predominant feature of the pole is the large Thunderbird which in Indian mythology is the noble and omnipotent ruler of the skies and master of the elements. It is the Great Eagle, respected throughout the area by all the coastal tribes. For the Kwakiutl it is particularly a symbol of family solidarity, the supernatural power that helped man build his first house. The human form on its breast signifies supernatural and human attributes.